Biscuits are super yummy but are definitely not allowed in the diet of those with food allergies to wheat, dairy, and egg products. However, these biscuits are vegan, gluten free and yeast free! 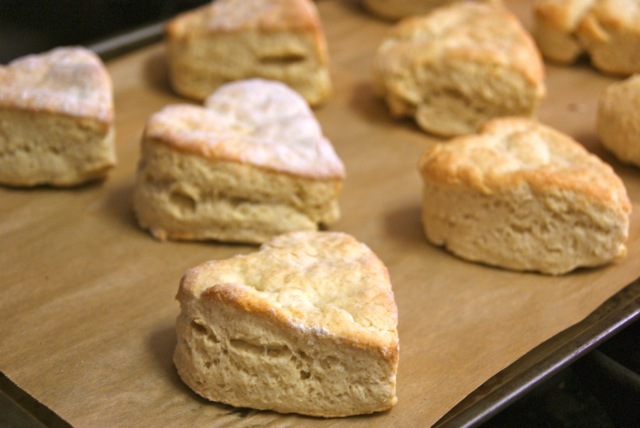 They are light and buttery tasting with a “normal” biscuit look. Purchasing prepared vegan and GF baked goods at a health food store will probably bust your food budget, so go the frugal way and make your own at home. They are super easy to make as well so you can be eating warm, homemade biscuits in under 20 minutes! Have a batch of biscuits baking in the oven as guests arrive and they will be welcomed with a pleasing aroma. Have your kids learn to bake too with this easy and kid-friendly recipe. Our little girl loves to bake with me and we enjoy making these together as an afternoon activity. She loves getting her hands floury and patting out the dough. She loves our heart-shaped cookie cutter and it adds more comfort to this already very comforting food. Generously flour your work surface with rice flour or the GF flour mix. Mold into a ball and turn onto floured surface . Knead dough 6-10 times. Roll or pat into a round disc that is about ½ inch thick. Dip biscuit cutter in the flour and cut out biscuits. Bake 9-12 minutes or until tops turn golden brown. Serve with your favorite veggie soup, chili, or with your afternoon tea! These look yummy! I have been looking for GF vegan baking recipes for bread that don’t include yeast. I am definitely going to try these out! Thanks! Good good good. I subbed the xanthan gum for chia seeds. Used real butter and taste like KFC. It would be nice if you could set it up so it did not take 4 pages to get the recipe. I am going to try them and I will let you know how i like them OK? Lois, that is great feedback! We will look into updating the format to make it friendlier to print the recipe. Let us know how you like them! thank you for this great recipe! I’m going to link to it on my blog:). I made them tonight and they are great! very simple to make, great dough. good tasting. I think I may add a bit of sugar next time, but all around…GOOD! Great to hear Esther! So glad you enjoyed the recipe! Can I use real milk (raw) and real butter without messing up the recipe? We aren’t vegan, just gluten-intolerant. I used real butter and a 50:50 mix of yogurt and water (that awkward moment when you’re baking something and realize you’re out of all types of milk). These are very very good. I don’t even like Bob’s Red Mill baking mix and was worried the biscuits would taste like it but somehow they don’t. Thanks for the recipe! So glad you enjoyed the recipe Lauren! I made these with unsalted butter and milk, but found the batter to be overly dry so I added an extra tbsp. of butter. They taste pretty good aside from being dense (didn’t rise while baking) and still a bit dry. Any suggestions? This recipe was exactly what I was looking for, thanks! But… how did you get yours to rise up so high (in the photo)? I’ve made them twice now and they hardly rise at all (same as allisong82 said). The taste is great but would be nice to have the height and fluffiness. I thought maybe you meant a “baking mix” for the flour (with extra ingredients) but the link you give goes to exactly the flour we have (Bob’s Red Mill Gluten Free All Purpose Baking Flour) – which isn’t called a “flour mix”. Can you confirm that’s the right flour? Or maybe it’s because we only have Earth Balance spread rather than the hard sticks (they’re not available at our store anymore). Will try with real butter next time and see if that helps. Using unsweetened almond milk for the milk. Hi Teresa, so glad you are enjoying the biscuit recipe! We do use the Bob’s Red Mill Gluten Free All Purpose Baking Flour and the regular Earth Balance. So it sounds like you’re on the right track there. One possible reason that yours didn’t rise as much as you’d like could be due to over-stirring. That one small change could make the difference for you. If you try it again, please let us know how they turn out. Thanks! I baked these. I cut the whole recipe in half, using about 1/4 cup coconut oil-they were awesome! So glad they turned out well for you! Hi Jeremy: I am trying the biscuits for the first time and , I too, was discouraged at having to print SIX pages just to get the recipe page. Your format uses too much ink and too much paper. Thank you for the comment Arlene. We will look in to a different format for our recipes so they can be printed using less paper. Six pages is too much, we’d like it to be only 1 page. Please let us know if you come across or hear about a good system or plugin for recipes on WordPress. We’re also considering putting all of our recipes into an ebook format so it can be printed or viewed on your mobile device or tablet easily. Is this something you would be interested in? I made this yesterday and my three kids loved it. Thank you very much, it was so simple and straightforward. So glad it was truly a good recipe. Great to hear! Really appreciate you sharing Nat. It’s always nice when your children enjoy healthy alternatives. Have you tried this with the other bobs gluten free flour. The one without garbonzo bean? Hi Mindi, thanks for the comment! I have not tried it with the bobs gluten-free flour without garbanzo beans but the recipe is pretty flexible so it should work just fine. If you try it out, please let us know how you like it!